Review: 2017 has sure been a kind year for Winston Churchill. The late prime minister of the UK has popped up on the small screen courtesy of John Lithgow’s award-winning supporting turn in Netflix’s The Crown, he’s mentioned favorably in Dunkirk and Their Finest, and now comes Darkest Hour where the spotlight is firmly on him. Though in death (as in life) he has as many critics as he does fans, this is a man that clearly deserves a place in the annals of history. 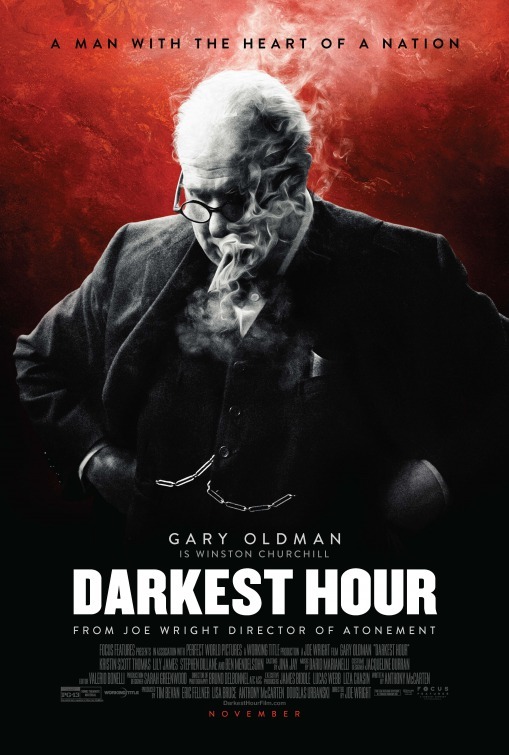 Thanks to an incredible leading performance, strong direction, and a solid script, Darkest Hour is an entertaining pop-up book that’s much more than just a lesson from the past. As the shadow of another World War looms over Europe, the British parliament is in upheaval and calling for the resignation of it’s current prime minister Neville Chamberlain (a sneering Ronald Pickup, The Best Exotic Marigold Hotel). Hoping to suggest a replacement that will have enough of a rough go that his political party can sweep in to save the day, Chamberlain suggests to the King that Winston Churchill take his place. Unliked since leading the failed Gallipoli Campaign during WWI, Churchill had been a strong voice against the Nazis back when no one was giving them or their leader much credence. The King (Ben Mendelsohn, The Dark Knight Rises) is leery about appointing a man he doesn’t trust but acquiesces. Over the next several weeks Churchill steps into the role during a firestorm of opposition from every angle, eventually steering the government to reject any notions of proposed surrender to German forces. In doing so, he gained the trust of the people as they banded together and rallied behind their sovereign nation at her most vulnerable time. All this plot is easily accessible in your tattered history book from sixth grade but while the details haven’t changed, it’s in the telling that creates powerful filmmaking. Director Joe Wright (Anna Karenina) has, as usual, crafted an intricate period film that’s striking in its detail and rousing in all the right places. Working with Anthony McCarten’s (The Theory of Everything) sharp script, Wright keeps the film refreshingly nimble, making even stuffy parliament scenes crackle with energy. Keeping his camera moving (with assistance from Inside Llewyn Davis cinematographer Bruno Delbonnel), he stages wonderful scenes of overlapping dialogue that are not only informative but interesting to watch. While most men in Churchill’s life gave him trouble (including a scheming Viscount Halifax played by Stephen Dillane, Zero Dark Thirty), according to Darkest Hour it’s two women that kept him in line during this difficult period. His personal secretary Elizabeth Layton (Lily James, Cinderella) starts off on the wrong foot with her demanding, persnickety boss but eventually develops into a confidant/cheerleader that he counted on. Same goes for his steadfast wife, Clemmie (Kristin Scott Thomas, Salmon Fishing in the Yemen) who isn’t afraid to point out to her husband when he’s out of line. Scott Thomas and James are both excellent in their roles and have ample time to shine, though I often longed for more scenes with Churchill and his wife and less with Layton as the marital relationship felt that it had more of an edge. All Wright has assembled would make for a strong film about Churchill but if he didn’t have someone to play the man himself it would have all been for naught. Lucky for him (and us) that he hired Gary Oldman because that’s what sends Darkest Hour skyrocketing. Oldman (RoboCop) gives the performance of his career (and what a career to begin with!) as Churchill, managing to work under superb prosthetics that transformed him into the historical figure but not letting the make-up do all the heavy lifting. His acting radiates from within, never coming off as showboating or faux but as a real-life rendering of a man challenged to lead in a time of imminent darkness. It’s just spectacular work and if he doesn’t win an Oscar for his efforts, well then, I just don’t know what to make of this crazy world anymore. Special mention must be made to Kazuhiro Tsuji (Looper, The Place Beyond the Pines) for his stunning make-up work for Oldman. It’s mighty difficult to age and fatten up the actor as he did but the seamless work should net Tsuji his first Oscar after two previous nominations. Same goes for Jacqueline Durran’s (Beauty and the Beast) luxe costumes that manages to make even Churchill’s suits look chic. I went into Darkest Hour not being totally in the mood for a history lesson and was surprised at how captivated I was for two hours. Even for a story where we already know how things turn out, I was often on the edge of my seat and truly entranced by Wright’s vision and Oldman’s performance. It’s not just a film made up of speechifying and hot air, it’s a thrilling examination of the forward momentum of a country that was cheered onward by a determined man.